I love biscuits! I think I could eat biscuits everyday! With butter and jam, with gravy, oh yeah with gravy and sausage…My favorite supper is Biscuits with sausage and gravy!! Preheat the oven to 450 degrees. In a medium bowl, combine the flour, sugar, baking powder, baking soda and salt. Cut in the shortening with a fork or use your hands until it looks like cornmeal. Add the milk, a little at a time, stirring constantly until well mixed. Heat bacon drippings in a cast iron skillet. Add the flour and whisk until smooth and bubbly about 1 minute. Add the warm milk slowly and bring to a boil. Reduce the heat to a low simmer and stir, until thickened, about 5 minutes, adding milk as necessary to control the thickness. Season the gravy with salt and pepper. Serve hot over biscuits. 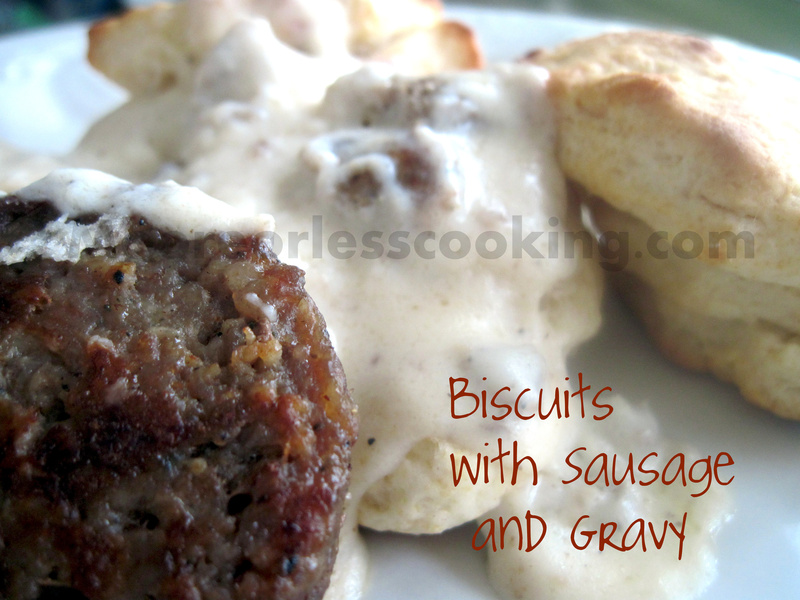 NOTE: Add some crumbled fried sausage to the gravy for a real treat! this is my favourite breakfast ever! To make brown gravy would you use water instead of milk? Yum!! I usually use a milk base. one of my favorite meals! i commented on the facebook post that i use the sausage drippings instead of bacon drippings. i forgot to mention that you can also put the flour, milk, and seasonings in a mason jar or other container with a lid and shake until combined, then slowly whisk into the drippings. works great! Better gravy yet is cook some Jimmy Dean hot and sage sausage together (1/2 and 1/2) until browned lightly add 2 heaping tablespoons of flour and mix with sausage well while cooking then slowly add milk stirring to mix well. Reduce heat and simmer till thickened. If it gets to thin mix a little corn starch with a little bit of water and add to thicken. If to thick add small amounts of milk. Way better gravy than bacon grease gravy. That’s how I make it, but without the cornstarch.